Puerto Rico Votes On Statehood Referendum — Though Congress Will Make Final Call : The Two-Way The debt-racked territory voted to become the 51st state in 2012, but Congress never picked up the result. 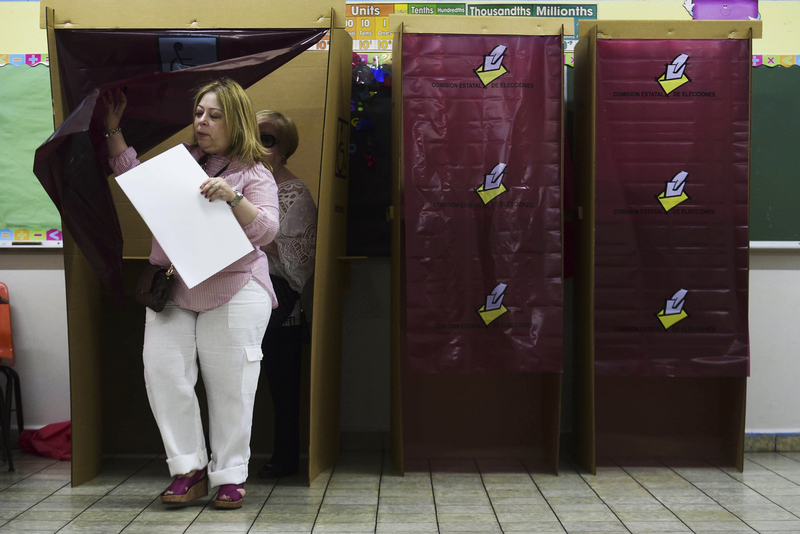 Puerto Rico voted again Sunday and partial results show most voters support U.S. statehood. A woman exits the voting booth in San Juan during Puerto Rico's nonbinding referendum Sunday. Puerto Rican voters are weighing whether to ask Congress for statehood. Puerto Ricans overwhelmingly voted for U.S. statehood for their island in a nonbinding referendum on Sunday. The Associated Press reports that only partial results are in but a low turnout and boycott by several opposition parties calls into question the validity of the non-binding vote. "More than 480,000 votes were cast for statehood, more than 7,500 for free association/independence and more than 6,500 for independence, with roughly half of polling centers reporting. The participation rate was nearly 23 percent with roughly 2.26 million registered voters." Puerto Ricans head to polls Sunday with one question in mind: Should the U.S. territory seek to become the country's 51st state? The question at the heart of the nonbinding referendum has been asked of Puerto Rican voters before — four times, in fact. In the most recent vote, which was held in 2012, the island opted for statehood, though many people argued the answers on the two-question ballot proved inconclusive. And Congress, the ultimate arbiter of the island's bid for statehood, never picked up the matter. Now, voters are casting their ballots under significantly different circumstances. The recession-racked island finds itself mired in upwards of $120 billion in debt — including public-sector bills and money owed to pension funds — and its struggle with creditors landed in court last month. Puerto Rico's attempt to restructure its debt, a bankruptcy-like proceeding tailor-made for its status as a territory, vastly outpaces similar municipal bankruptcies like Detroit's $18.5 billion Chapter 9 filing in 2013. Gov. Ricardo Rossello campaigned in favor of statehood, promising the referendum in the event of his election. He argues that statehood would help Puerto Rico in its attempt to face down its debt crisis. But rival parties on the island — the Popular Democratic Party and the Puerto Rican Independence Party — support a kind of continued territory status or independence, respectively. Reuters reports that calls for boycotting the referendum have some onlookers concerned about anemic turnout at the ballot box Sunday. Either way, U.S. Rep. Luis Gutierrez, whose parents hailed from Puerto Rico, cautions the wire service that "Congress won't do anything." The BBC posits this reluctance might arise from two reasons: a GOP-led Congress would be wary of admitting a Democratic-leaning electorate like Puerto Rico's, and the debt-troubled island would likely require more federal spending to get back on its feet. Still, Rossello says that he's grateful for his island's connection with the U.S., and that he remains hopeful that connection will grow closer. "The bad side of it is that we are not a full part of the United States," he told NPR's Greg Allen and Marisa Peñaloza earlier this year. "We're a territory or a colonial territory. We're aiming to change that and of course, from my perspective, I'd want Puerto Rico to become the 51st state of the nation."